Stacking Racks are used generally when the merchandise cannot be piled up one upon the other and the use of conventional Metallic Rack Systems is not justified financially. Designed specially for the storage of slight and/or miscellaneous merchandise within bookcases or outside them. It allows having a complete visibility and protection of the products. It optimisesthe storage space thanks to his pile-upable design. Easy access of the fork truck by all its faces. 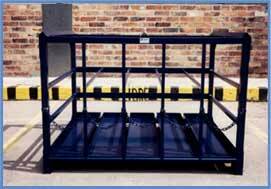 Its solid construction allows the storage of heavy, voluminous and irregular loads.They cause that certain products or merchandise are easier to store and to handle within the Metallic Rack Systems. They increase the yield, protect the merchandise against the deterioration, and reduce costs of storage, packing, manual labour and possible risk of accidents. 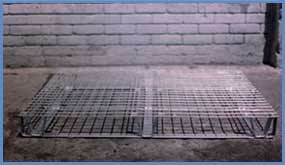 Designed for the specific necessities of the Client, they can be made of Mesh, Angles, Tubes or have a special design. They are possible to be designed with a system of folding walls, which reduces the storage space when they are not used. The collapsible option to have one or several doors allows the access to the merchandise when the containers are piled up. Metallic pallets are designed with the intention of avoiding the continuous and expensive replacement of the traditional wood pallets. 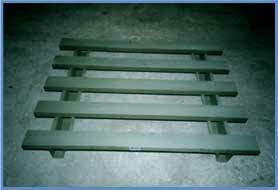 They are made with the purpose of being compatible with the Metallic Rack System and the truck to use in the warehouse. Tailor made to the measurement and necessities of the Client, in order to support load or to make picking operations. They can be made of Steel or Mesh of Metallic Wire, in agreement with the characteristics and exigencies of products to store. Talleres Técnicos Colombianos T.T.C. Ltda. Santafé de Bogotá D.C. - Colombia - América del Sur.